Vintage 10 Strand Tahitian Mongo Shell lei necklace. These Mongo Shells are natural, undyed colors of grays, black and white. The 10 strands are accented with a black ribbon bow at the back. World War II era and in perfect, pristine condition. 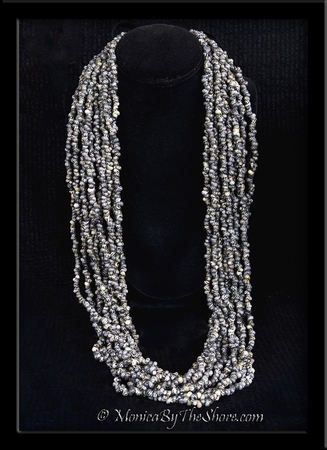 The lei necklace measures 36 inches in length. This style of lei was typically worn for special occasions, important ceremonies such as for a wedding, and also for Hula dancing. An exceptional piece of Polynesian seashell jewelry. Rare antique seashells jewelry designs presented by MonicaByTheShore, with Aloha on the North Shore of Oahu, Haleiwa, Hawaii.